Being definitely aware of the difficulties encountered by travellers when confronted to unfamiliar cooking traditions and terms . The author dedicates this first guidebook to the tourists , amateurs of French traditional food france.Pierrette, who has a passion for cooking , hopes to make her contribution to valorize the products of French « terroir » and enable foreign visitors to discover them through photos and full descriptions . 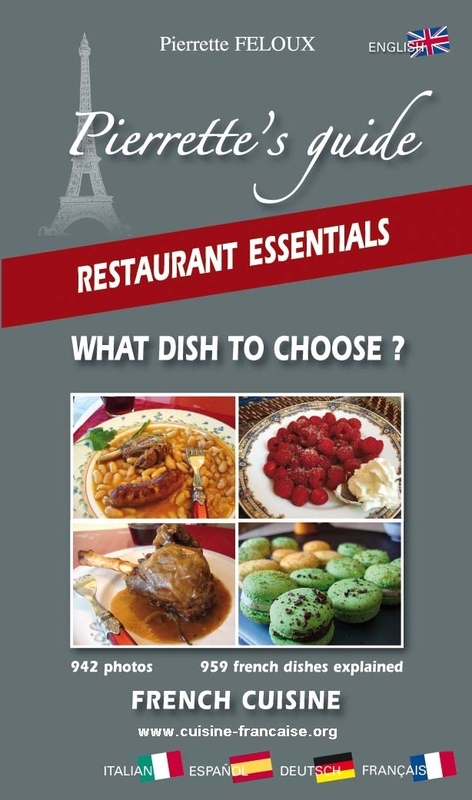 Choosing a dish ( or a menu traditional food france) and tasting it brings any gourmet a real pleasure . The terms used on menus traditional food france in most French restaurants have been adapted by the author . 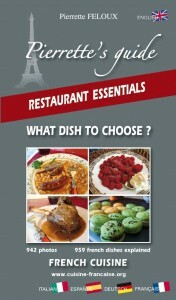 It will make it easier for tourists to understand the menu in any French restaurants or « brasseries » .